. : Optics & Photonics Focus :: Fairy Penguins Know Best :. A Fairy Penguin. Fairy Penguins live along the coastline of Southern Australia and New Zealand. 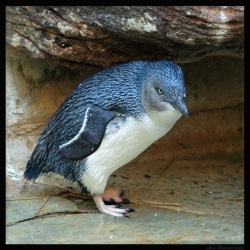 They are the world’s smallest penguins and their feather barbs have characteristic blue shades. Photo by John Denman. They make us laugh because of their gawky walk. They appeal to our emotions because, when they mate, it is for life. Clumsy on land and elegant underwater, penguins are quite unique birds and definitely a neverending source of amazement. A recently discovered biophotonic structure is the reason for the characteristic blue shades in the feather barbs of the Fairy Penguin, a species found along the coastline of Southern Australia and New Zealand. This finding is the result of a collaboration between scientists at the University of Akron (Ohio, USA), Yale University (Connecticut, USA) and the University of Texas at Austin (Texas, USA). Fairy Penguins, and other animals, could inspire the fabrication of new manmade photonic materials. Photonic structures have existed in the natural world for millions of year, but only in the past century have scientists and engineers independently reinvented them . They are arrangements of nanostructures designed to manipulate the flow of light and they appear, amongst other examples, in the feathers of birds, the wings of butterflies and the exoskeleton of beetles. "There are many manmade analogues to natural photonic nanostructures," says Matthew D. Shawkey at the University of Akron. "Simple thin films are abundant in iridescent feathers and are found in everything from household mirrors to antireflective coatings. 2D hexagonal arrays are also found in some iridescent feathers and in photonic crystal fibers. 3D nanostructures are less commonly manufactured, but some opal and inverse opal materials have been made." Despite our progress in the fabrication of photonic structures, we still have to bow our heads respectfully to nature . Arrays of keratin nanofibers. A close up of a Fairy Penguin’s feather barb. The keratin nanofibers produce the characteristic non-iridescent blue color by coherent light scattering and constitute a novel morphology for feathers. Photo by Liliana D’Alba. The new photonic structure, found in the blue feather barbs of the Fairy Penguin, appeared a little unexpectedly. Until now, only two morphologies of photonic structures, which produce non-iridescent blue colors, were known in the feathers of birds . The first morphology — the spheres — is based on nanosized bubbles of air in a matrix of the protein keratin; the second morphology — the channels — is based on more irregular matrices of keratin and air instead. "The dogma so far was that colored barbs are caused by 3D spongy structures made by somewhat irregular air spaces and keratin," points out Doekele G. Stavenga at the University of Groningen (The Netherlands). Differently, Fairy Penguins use densely packed bundles of parallel keratin fibres surrounded by air spaces to produce the blue shades in their feathers. The structural or biological importance of these nanofibres is not yet clear. "It is interesting that these photonic structures are found in feathers of penguins, which fly through water — many times more viscous than air," Shawkey speculates. "Such ordered fibers could add some strength to the feathers, but we need to sample more broadly to see if they are found in other birds besides penguins and, of course, perform some material property analyses." As this case clearly exemplifies, there are potentially many new natural photonic nanostructures with interesting optical properties that we do not yet know about. "There is ample interest from applied physicists and optical industries to replicate natural photonic structures. Photonic crystals, for example, is a very hot area in optics research, with many potential applications in improved LEDs, garments, paints and cosmetics," adds Stavenga. "The beauty of bird feathers (and butterfly wings, and shiny beetles) is starting to be understood in sufficient detail, because of appropriate advances in anatomical, as well as physical methods, so that the wonders, developed by nature in a long evolutionary process, can now be reproduced, leading to novel technical applications that will enrich the lives of numerous people." Furthermore, learning how animals, such as Fairy Penguins, assemble photonic structures could offer a valid alternative to present fabrication techniques, which are limited and often prohibitively expensive. 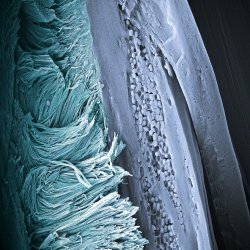 "Learning how animals grow these complex nanostructures may provide us with insight into new manufacturing techniques," explains Shawkey. "This is important because one of the challenges of using nanostructures for applications is manufacturing them quickly and cheaply. Animals appear to do this quite easily, perhaps through self-assembly, so we might get some inspiration from them." Behind her cute appearance, the Fairy Penguin hides a lot of wonder… wonder from which we can actually learn. In the 30-cm tall body of the world’s smallest penguin, there beats the heart of a true Guinness Record! P. Vukusic & J. R. Sambles, Photonic Structures in Biology, Nature 424, 852-855 (2003). E.R. Dufresne et al., Self-assembly of amorphous biophotonic nanostructures by phase separation, Soft Matter 5, 1792-1795 (2009). Liliana D'Alba, Vinodkumar Saranathan, Julia A. Clarke, Jakob A. Vinther, Richard O. Prum & Matthew D. Shawkey, Colour-producing β-keratin nanofibres in blue penguin (Eudyptula minor) feathers, Biology Letter (2011) , (link).